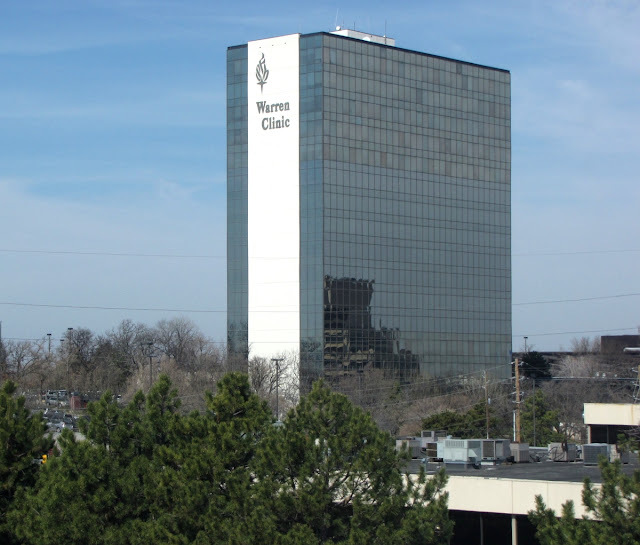 The Warren Clinic Tower, 6600 South Yale Avenue, Tulsa. It reflects a lot of sky. This is a long shot from Sue's hospital room in St. Francis a few weeks ago. She had a hip replaced and is doing much better now. You didn't tell us about Sue - glad to hear she is progressing well. I am awaiting my second knee replacement in early summer. I like well situated glass buildings. Soemtimes the reflections can almost make them disappear.